Super PACs are here to stay. 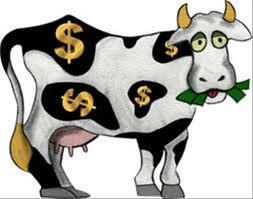 These special interest groups supporting a party or candidate can raise boat loads of cash while avoiding campaign finance laws. The GOP loves them. The Dems are learning to. The Sunday Aug 28 NYT listed several that are collecting money to support Republican presidential candidates. I’ve listed the real ones and added some suggestions. Please add your own and share them. This might be the only fun we have in this election. Voter guides – who picked the winners? I charted eight voter guides that randomly appeared on my doorstep or in my mailbox: the SF Bay Guardian, the San Francisco Women’s Political Committee, the California Democratic Party, Equality California, the Harvey Milk LGBT Democratic Club, the Alice B. Toklas LBGT Democratic Club, the Pissed Off Voter Guide and the San Francisco League of Conservation Voters. Then I compared their endorsements and recommendations and my voting cheat sheet against the official list of SF winners and CA winners. Every time a voter guide and an election result matched, the guide received 1 point. I applied the same scoring for my voting record. 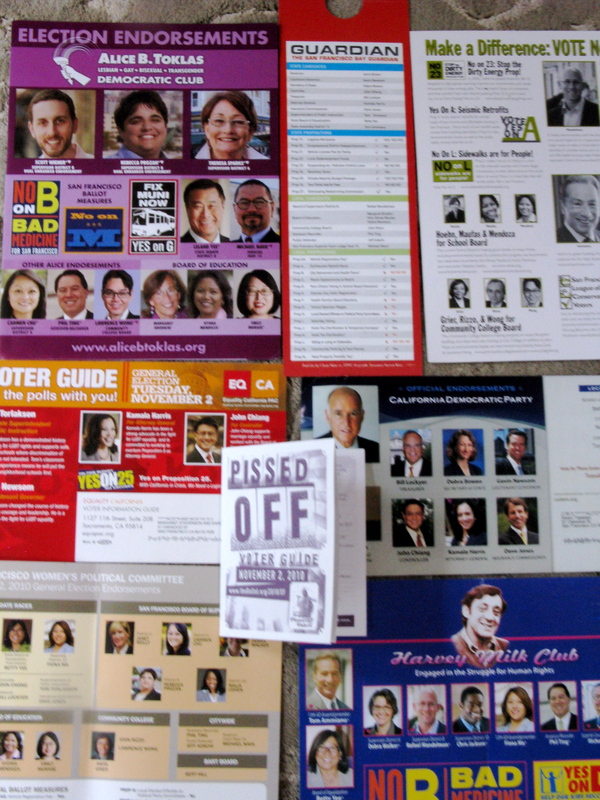 To be fair, not every voter guide included all of the SF propositions and candidates. But for the ones that did. The SF Women’s Political Committee voter guide scored the highest with 30 points out of a possible 45. The Alice B. Toklas LGBT Democratic Club came in second with 27 and a close third place fell to the SF Bay Guardian with 26 points. And I scored a 28! All of the voter guides got it right on the statewide candidates. The SF Women’s Political Committee received the highest scores for the statewide props. Scoring 4 out of 9. Everyone who weighed in on Prop 19, legalizing marijuana, obviously got it wrong. But every group that listed an opinion about Prop 23 and 25, scored a win. On the SF propositions, the tie for first place goes to the SF Women’s Political Committee and the Toklas Club with a score of 9 out of a possible 15. The Bay Guardian, the Pissed Off Voter Guide and the Milk Club all scored 8. I beat them all with a 10! The lowest score for guides that endorsed local and statewide belongs to the Pissed Off voters. Getting 20 out 45 correct. But hey, they tried. This survey should not be construed as scientific or predictive for the future. But it does tell me that in this election the Women’s Political Committee, the Toklas Club and the Bay Guardian seemed to have their finger on the pulse of the California voter. And so did I!